Mastering the Art of Selling is a classic -- whether you're a seasoned pro or just starting out, Mastering the Art of Selling's five essential steps to selling are guaranteed to give you the edge you need to excel. The Academy of Master Closing covers the most crucial aspect of selling: closing the sale. This power-packed audio gives you the same secret closing techniques that Tom Hopkins teaches in his overwhelmingly successful seminars. Advanced Sales Survival Training shows how to relieve stress, communicate better with your clients, restore balance to your career, and enjoy yourself as you are on your way to increasing your overall effectiveness, and your profits! 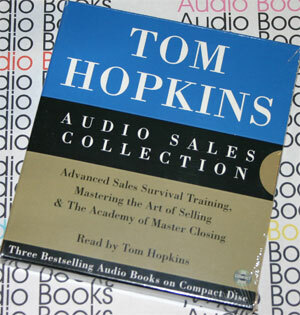 Tom Hopkins is a sales legend. Many believe that natural ability is enough to make you successful in a selling career. The truth of the matter is that natural skill, combined with "how to" training is the real secret to high level productivity. Having learned this lesson the hard way, Tom is quick to admit that his early sales career was not successful. After benefiting from professional training, he became a dedicated student, internalizing and refining sales techniques which enabled him to become the sales leader in his industry. The basis of our training is how-to strategies and tactics, not motivational hype. If students become motivated after learning our material, it's because they understand the power of the training and how they can increase their incomes because of it. Our training materials are constantly updated through our daily contact with business leaders and sales professionals. Their feedback is an invaluable resource that helps us keep our training relevant in an ever-changing business world. Due to the extraordinary demand for the unique training we offer, we have received international recognition and earned a reputation that is synonymous with effectiveness, productivity and integrity. Our material transcends a wide variety of cultures and has been translated into eleven foreign languages. Our live seminars have been presented in North America, Europe, Africa, Asia and Australia. Tom's credibility lies in his track record and the track records of the students he has trained over the years. He has personally trained over three million students on five continents. He has shared the stage with some of the great leaders of our times including Ret. Gen. Norman Schwartzkopf, former President George Bush and Barbara Bush, Secretary of State Colin Powell, and Lady Margaret Thatcher. Providing sales training in several mediums is how we have reached a broad spectrum of businesses. Tom has authored twelve books, including How to Master the Art of Selling and Selling for Dummies™. His first book, How to Master the Art of Selling, has sold over 1.6 million copies and been translated into ten languages. It is used as a text book in sales and marketing classes and is required reading for new salespeople by sales and management professionals in a wide variety of industries. Tom was a pioneer in bringing broadcast-quality video training to the marketplace. Over 16,000 of our video sales training systems are utilized in-house by companies around the world. His audio cassette programs have long been lauded for their quality, comprehensiveness and workbooks with word-for-word phraseology. Through the ups and downs of a selling career, as a business owner, professional speaker and trainer, Tom Hopkins has maintained his dedication to the continued growth of his students. He firmly believes that everyone can benefit from utilizing his proven techniques, ideas, concepts and values. Tom invites you and your sales team to experience the benefits of his "training for Champions."